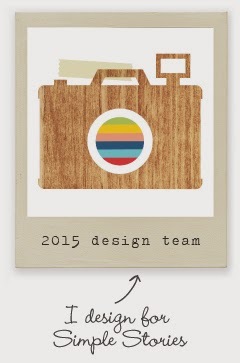 Today I want to share how I have prepared my 2015 Project Life album. (well, albums) I am so happy to say that I am officially ready to go. Bring on 2015. My approach to Project Life is to complete weekly spreads with the occasional event/trip/ect spread. It has always been this way and this year will be no different. I like to add "STUFF" to my pages as you all know. This leaves them somewhat bulky. In the past I have always needed 2 albums and I have set up 2 albums for 2015. This year I went with 2 Becky Higgins 12x12 albums. They are the Cinnamon edition. I have to confess that I was not at all prepared in advance for 2015. *Mental note for next year - PLAN AHEAD OF TIME * Anywho, I didn't want to wait for them to get here if I ordered them online. So I went in to my local Michaels and picked some that I liked, and some that they had a quantity of 2 of. So there you go. But hey, I'm all set up and ready to go now. * I plan on doing my first week with the Studio Calico kit and I waiting ever so impatiently for that to arrive so that I may start. ** Come on UPS truck !! This is what my album currently looks like. I have gathered a few items for my title page. I plan on getting some individual pictures of all of my family members soon to put in the album. Also going to add some other fun cards and such. I will share my title page when it is finished I promise. I went ahead and made some temporary title cards this year. 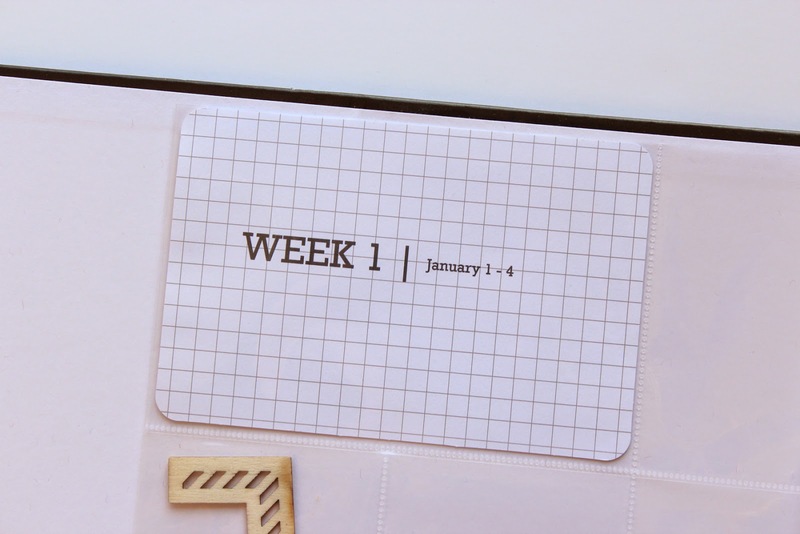 I used the plain grid 4x6 cards and printed out the week # and the dates. 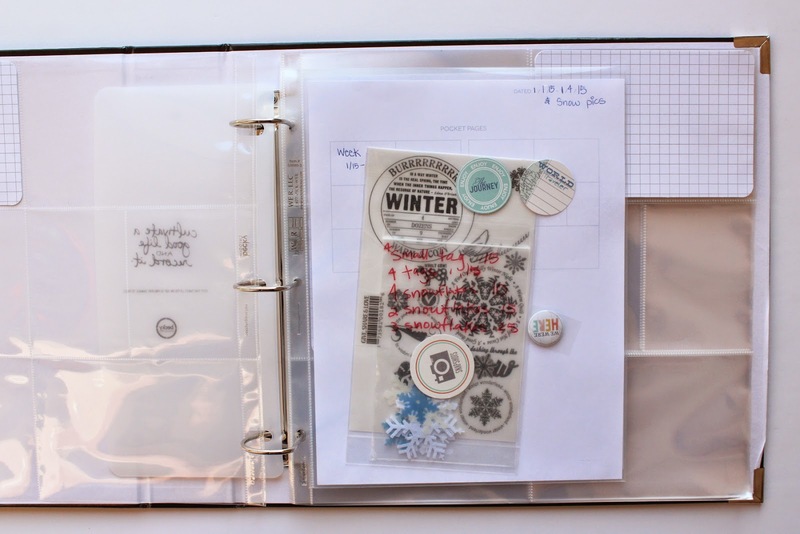 You could most certainly use some scraps, plain cardstock or whatever you have on hand. You can also hand write the information to save time. I like to have these title cards in my album ahead of time so I know what week it is, more on that in a bit. I'm a planner. I'll admit it. Especially when it comes to my Project Life. 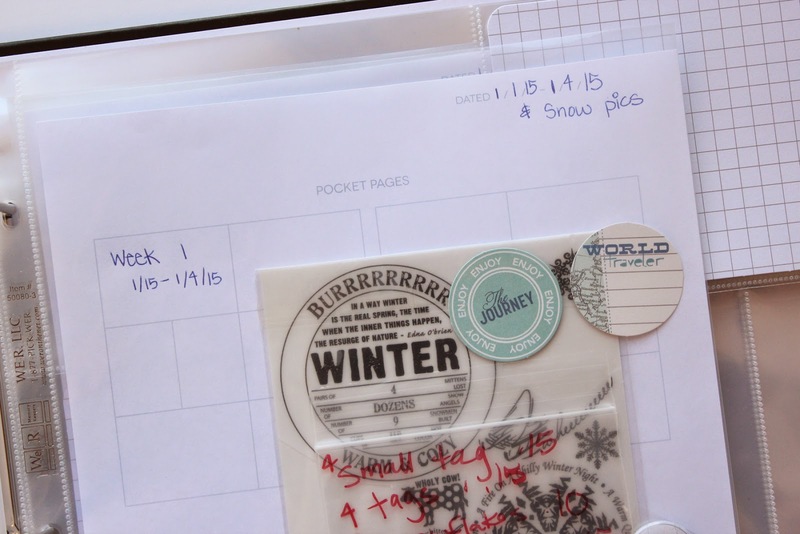 I have been using these planner sheets from Marcy Penner for years now and I LOVE them !! I used a 8.5x11 page protector in between each week. Inside the page protector I added one of the planner sheets. The reason : It's right there ready to go. I don't have to go and print one ahead of time. I use these planner pages to plan out my spreads. I can easily write in what photo is going where, where I want a certain journaling card when it is time to sit down and actually do my week. 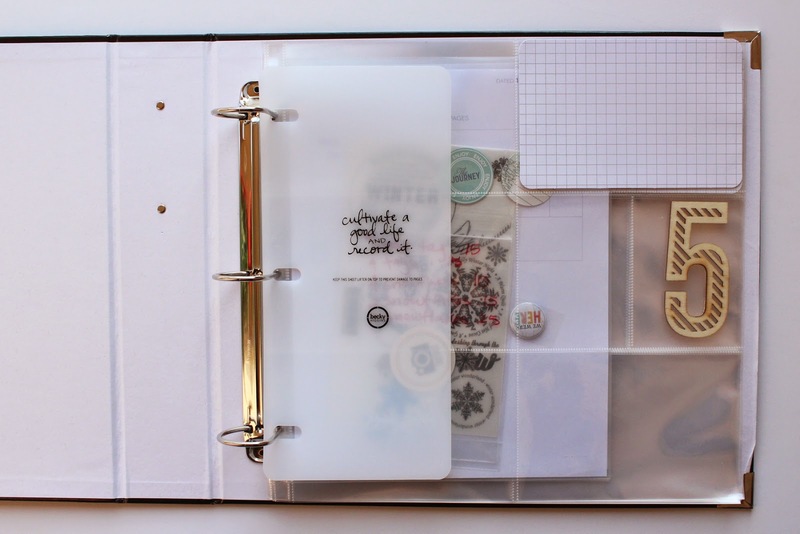 I also use the smaller 8.5x11 page protectors to house my ephemera, school items, well you get the idea. Anything that I need to save from that week. I also use the envelopes to keep some items that I might want to use with that week. As you can see I have some items in the page protector that I want to use. As you can see there is a place for the date on the page planner. I love it ! 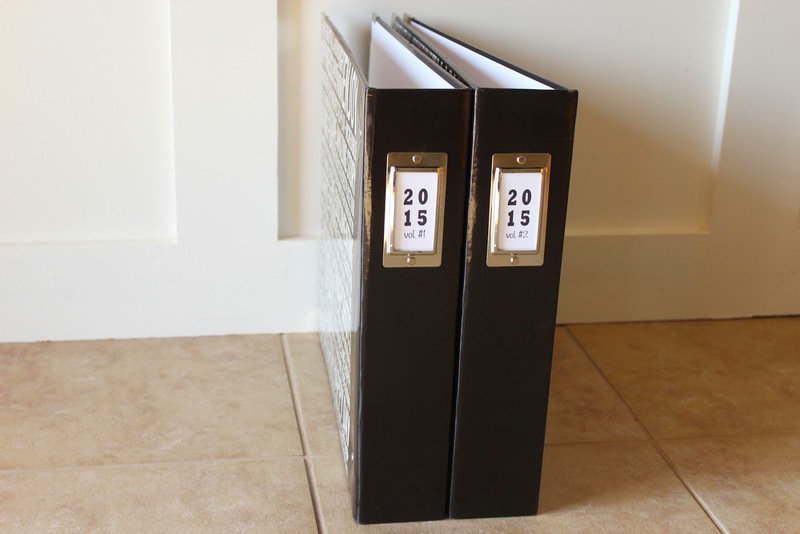 YOU CAN FIND THE FREE POCKET PAGE PLANNERS HERE. 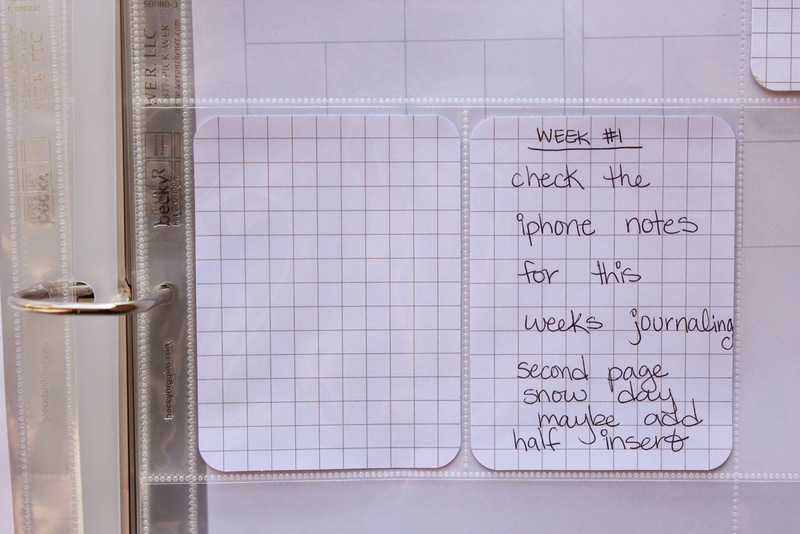 The last thing that I like to do is to add a few plain journaling cards in each week. As the week goes by I can easily write notes on them. Things that we did, quotes, ideas, ect. Over the years, I have found that these few simple things have kept me successful in creating meaningful Project Life albums. I plan on printing photos tomorrow and start the planning process for my week 1 tomorrow and finish it up when my SC kit arrives. Have you guys started 2015 yet ? Still working on 2014 ? * Stay tuned for a new Project Life post coming soon. I have several spreads from last year that I have not shared yet !